As the eighth largest dairy-producing state, Michigan is home to more than 400,000 dairy cows spread across farms with herds numbering from thousands to fewer than 100. Feeding such a large number of animals is challenging and expensive. Michigan dairy farmers spend over $730 million each year - about $5 per day per cow - to keep their herds well-nourished and producing enough milk to meet consumer demand. 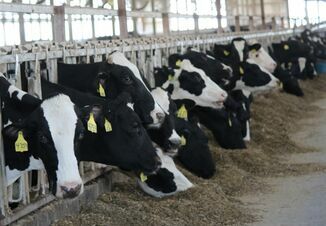 Michigan State University (MSU) AgBioResearch scientists are working to bring that cost down by combining genomics and nutrition science in an effort to breed cows that require less food to produce the same volume of milk. Following the Human Genome Project, which also had numerous discoveries for animal science, livestock breeders have taken advantage of the wealth of dairy cow genetic information to select bulls capable of passing along the most desirable traits to their progeny. These include such characteristics as size, milk production and disease resistance. Genetically selecting bulls for feed efficiency, however, has been more difficult. Because cows on commercial dairy farms are fed in groups, acquiring data on how much an individual animal consumes is nearly impossible. Genomics now allows researchers to study the DNA of university dairy herds, look for genetic markers for feed efficiency and deliver that information to the industry. Thanks to a five-year multi-institutional grant from the U.S. Department of Agriculture (USDA) National Institute of Food and Agriculture, scientists from MSU and other universities are closing in on the genetic markers for feed efficiency. Collecting feed intake data from 7,000 cows from university herds in Michigan, Wisconsin, Iowa, Florida, Maryland, Virginia, New York, Alberta, Scotland and the Netherlands, the team identified which animals ate less than expected on the basis of their production and took genetic samples for analysis. Most samples were analyzed by industry partner GeneSeek (a subsidiary of the Lansing-based Neogen Corporation), and the data were submitted to the USDA Animal Improvement Laboratory in Beltsville, Maryland, where much of the genomic data on the U.S. dairy herd is kept. The lab staff processes the samples and sends back the list of individual elements‚Äîcalled single-nucleotide polymorphisms (SNPs)‚Äîthat make up each animal's genome. Statistical modeling can be used to determine which SNPs are related to feed efficiency. 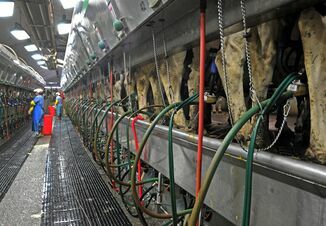 Five thousand cows have been genotyped so far; the remaining 2,000 are still being analyzed. Feed intake data is also being collected on 1,000 additional cows. Once the process is complete, a final equation for feed efficiency will be ready to report to the industry. Extension and educational tools to communicate these findings to breeders, producers and dairy nutritionists are also being prepared, including state-of-the-art Web-based tools to analyze feed efficiency and grouping practices on commercial farms. Results of this effort will reduce feed costs without sacrificing production. 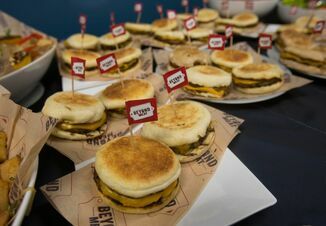 An Australian team did a similar project and showed that it is reasonable to believe that feed costs could be reduced by 50 cents per cow per day, or about 10 percent of the current daily average cost. This research will give breeders one more tool for selecting bulls to maximize yields. The results will most likely be ready for industrywide implementation within two years.